All songs written by Sofia Talvik, except ­“Starwalker” by Buffy Sainte-Marie (Kobalt Music). Vocals and ­acoustic guitar Sofia Talvik, electric and acoustic guitar, dobro and lap steel Marcus Högquist, bass Janne Manninen, drums and percussion Joakim Lundgren, banjo John Bullard, violin Mathis Richter-Reichhelm. Guest musicians on “Give Me A Home” – David Floer: cello, Jozsef Nemeth: piano. All other instruments by Sofia Talvik. The Big Sky Choir Boys: Jonas Westin, Isaac Cheong, Jim ­Magdefrau. Produced by Sofia Talvik. Recorded in Mahoni Studios, Berlin, Recipe Music Studios, Stockholm. Mixed and mastered by Mathis Richter-Reichhelm. Graphic design by Sofia Talvik. Talvik is one of the most prolific artists I have seen in years. Clearly there is a lot of love and support for her music. Having crafted a series of E.P.s, albums and songs; it seems the young Swede has no signs of slowing and retreating- becoming more potent and amazing with every new release. Her sounds dig deep into the heart and elicit something truly awestruck and amazed. One of the best and most intuitive songwriter on the scene; her music takes your mind to the scenes and sights she sings- it is such vivid and raw music that rewards those that love music with depth and soul. Big Sky Country is as stunning and rich as its cover art: music that covers a wealth of topics and explores love, hope and wonderful characters. There are few artists that have the prolific and consistency as Talvik. A lot of new acts start nervously and take a while to release something new- there can be big gaps between E.P.s. Talvik has a great work rate when it comes to music; constantly writing and recording she has kept fans and reviewers salivating with her staggering sounds. As 2015 draws to its close Big Sky Country– a mini-review will be near the end of this piece- is a truly awesome statement from one of the music world’s biggest propositions. The gorgeous Swede could well go onto conquer the U.S. and see her music being adored there- there is no reason why she could not tour the country very soon. That said, the U.K. loves her music and it would be great to see her come here and play. With so many great female artists emerging; Talvik ranks among the most talked-about and talented I have encountered. That soft, swooning and emotive voice ensures every word is brought to life with force; no listener is immune to the wonder and passion. Some of new music’s female artists are letting the ball drop and come through quite insincere and lacking. Among the variable quality there are a band of artists that are truly entranced in music and giving everything to it- those acts we should all watch for in the next year. Talvik is a true talent with immense song-writing ability and a voice impossible to compare with anyone else- how far she can go in 2016 is anyone’s guess. I can see an E.P. or album emerging; some tour dates too- hopefully she can come and play London. If you have not heard Big Sky Country; ensure it is at the top of your ‘to-do list’. When it comes to the 2015 sounds of Sofia Talvik is savvy looking back to see how she has progressed and evolved. Florida was an album released in 2010 and boasted vivid and bold sounds- just look at the cover art to the album! Building from her softer and gentler beginnings- that is what her sound was defined as- the album marked a shift towards bigger and bolder arrangements. Trombones, cellos and orchestral touches ensured the album provided a richer and more ambitious shift- bringing richness and variation into the fray. The album highlights the drums- Talvik wanted it to be a central figure- and the album marks a love letter to the U.S. – a country the heroine is keen to explore. The entire album shows a consistency and musical adventurousness: genres and themes are mixed to create a great blend of Country, Folk and Pop. The Owls Are Not What They Seem was released at a time (2011) when Talvik was preparing a work visa for the U.S. – about to tour the nation. The songs signal a return to basics and that stripped-down approach. The album’s aesthetics look at D.I.Y., bedroom-recorded numbers that have intimacy and sparseness. There is great atmosphere and emotion throughout: you picture yourself alongside Talvik; there is that drama and closeness that brings you into each song- such a wonderfully direct and passionate album. The album explores delusions, good and evil and love; the inequalities of relationships and the need for compassion- themes and ideas every listener can relate to. The vocals boasted dreaminess and huge effects- that breezy and passion the likes of Lana Del Rey bring into their music. In spite of the D.I.Y. approach there is a lot of atmosphere and cinematics to the music- the compositions bring in classical strings and a variety of sounds to create a lush and heart-warming collection. Big Sky Country marked a return for Talvik after a little while- the songs were recorded over several months whilst our heroine and once again was inspired by the U.S. Whilst touring and living there she got the chance to reflect the people, places and landscapes into an album that is her finest work- that creation that blends the big and bold sounds with the intimacy and sparseness. 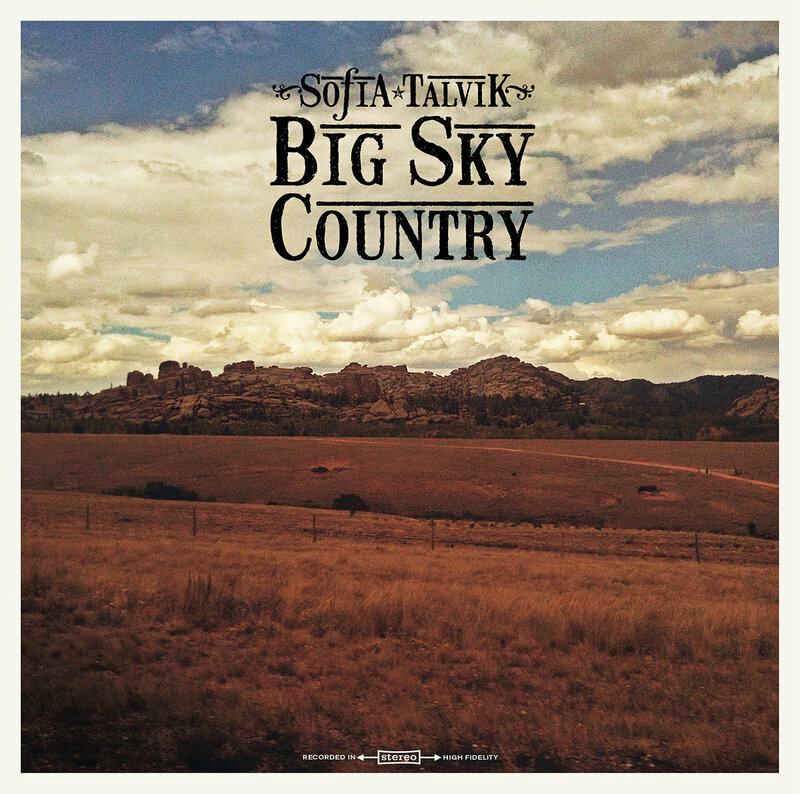 Combining various (previous) albums together; Big Sky Country shows Talvik at her most impressive, stunning and best. The horizons and possibilities are explored; that unwavering passion for people and places; the album is that storybook that unites the old and new- into an album that has gained a huge amount of respect and kudos from fans and reviewers. We have an artist that gets stronger and more impressive with every new release. It means the next year will be very exciting and interesting. It would be great to see another E.P. released. Whether Talvik locates to the U.S.- or records in Sweden- it will be fantastic discovering what comes next; whether an E.P. or an album- a new chance to see another side to the young artist. Given what Big Sky Country offers, who knows just how far she can go. I was keen to explore Starwalker as it represents all the emotions and ideas of Big Sky Country. Written by Buffy Sainte-Marie- Talvik makes the song sound deeply personal and meaningful- it is a stunning number. Beginning with a couple of electronic strums- eliciting a dark Country vibe with something atmospheric and bold- you get a song that begins with urgency and strange feelings. A deeply emotional and direct beginning, it soon explodes into a rapturous and delirious wordless chorus- our heroine lets her voice fly and entwine. From the darkness and twilight danger you get that morning sunshine and awakening- taking the listener through a 180 degree spin within a few seconds. Captivated by that raw energy and stunning rush; the song builds these wordless vocals together to create colourful strands and contrasting emotions. There is that mixture of tribal clarion call and spiritual awakening. Our heroine is letting her soul fly and her emotions soar- it is a bracing and urgent opening that makes the listener stand to attention and become entranced. Our heroine lets it be known that “Starwalker, he’s a friend of mine/you’ve seen him looking fine”; making you wonder the origins and truth of the lyrics. Quite oblique and fantastical; there is that sense of dream and detachment. Whether Starwalker is an alias for a lover or a dedication to the beauty of nature- a natural force that is giving her strength and focus- you are hooked by those special and original words. It has a literary approach to it that compels you to imagine images and possibilities. My mind instantly went to a giant landscape or a rolling scene- like the cover to Big Sky Country. Perhaps enveloped in the night’s air there is that lone light in the sky- something quite mystical and strange. It is good to hear a song whose origins and nature is not that obvious and evident- something that every listener will have their own view on. Whilst a lot of musicians go straight for love and relationships- the themes are explored in the album- Talvik prefers a more novel and personal approach to things. Her songs look at nature and geography; something that strays away from pure emotions and heartbreak. Whilst the vocals and instrumentation climbs and stuns; my mind keeps digging into those vocals- and what they represent. The song has a consistent energy and energy that makes the imagery and lyrics come to life and get straight inside the mind- it will remain there for a long time to come. Propelled and captured by the passion in that vocal; I was looking towards it seems Starwalker is a “straight talker”; it is best not to drink wine- that mystery and unexpectedness keeps coming. Maybe Starwalker is a truth or personal honesty; if you drink you become more honest and foolish perhaps- maybe I am over-reaching and missing the point. That is the true beauty of the song: there is no direct meaning (for the listener at least) so you are always trying to find what the song is looking at/saying. Wolf Rider is introduced in the next verse- a friend of ours and someone who opens doors- that looks at another figure or emotional representation. Perhaps she embodies opportunity and potential- that spirit inside that makes everything possible and provides chance and hope. It is said she’s a “sweet grass burner” and a “dog soldier”- those vivid and quirky ideas take your thoughts in another direction. After that mystical quest and outpouring- taking in the lyrics your head starts to layer images and scenes- our heroine lets that wordless vocal call across the night. It seems like Talvik is providing a paen to nature and the beauty of the outdoors- embracing it and its captive grace. As our characters and figures have been paid tribute; the holy light guards the night- our heroine asks it to “pray up your medicine song”. It seems the richness and medicinal qualities of the night have infused the spirit; caused something quite primal and wonderful in our heroine. That enticing and strange vocal call has a beauty and serenity to it- in the verses Talvik sounds a little like Laura Marling. Lightning woman and thunder child are in the mix this time- nominal representations of the meteorological- that embody harsh weather and the change of climate. You can imagine the country sky exploding and bursting with colour and light. The clouds build and the thunder rolls; our lady asks them to “aim straight, stand tall”. Bringing the listener into the song directly- and summoning such an army of wonderful images- you cannot help but get lost in the energy, emotion and raw passion that are created. That vocal remains firm and rousing from start to finish- never dropping or letting that electricity dim at all. That combination of elements and figures; the coming-together or weather and nature- leads to a song that is a stunning and vivid creation. The composition has a terrific percussion that helps to summon that idea of thunder and drive; the passion and pummel the song represents. Bringing in aching strings to the mix; it sees Talvik create something euphoric, atmospheric and bold- embracing that fuller sound of the past. The final moments see the vocal come fully into effect and return to that wordless coda. Our heroine allows her voice to reflect that raw passion and strong emotion- the listener is always guessing and imagining the images and ideas being explored. By the final notes you get to reflect and breathe- taking everything in and getting to the bottom of Starwalker. Starwalker is the most urgent and impressive number from Big Sky Country. A great representation of Sofia Talvik and her various sides; I was amazed by the depth and ambition explored across the song- there are plenty of gems across the record. That sense of oblique and mysterious continues right across the album. Aha-Aha starts things with a little more directness and tangible relatability. Words about sealing your heart with faith; looking in the mirror- it has a more personal and human element to things. Talvik’s voice is pure and beautiful throughout; ensuring she gives the song the heart and soul it requires- one of the most beautiful and aching songs across the record. That need for redemption and hope comes out; pushing you and keeping sweethearts close- not losing what’s inside and what could be. A stunningly assured and strong opener- I get shades of Led Zeppelin III within the composition- there is a nice mix of pastoral Folk and something Country-based. The title track is the most evocative and heart-aching song across the album. Talvik’s voice is stunning and tender across a song that looks at the Blue Ridge Mountains and Texas; across the U.S. and the states. The heroine takes her lyrics across America and the passion for the country; it recounts Talvik’s journeys and travels- and the great people she has met. Perhaps the album’s most soul-bearing and love-filled song; it is a love song to a vibrant, varied and wonderful country. Dusty Heart, Empty Hand has a catchy drive to it that puts it firmly into Country territory. That compelling pace and passion comes out in a song that looks at betrayal and deceived hearts. With her voice clear and emotive; the song recalls a troubled relationship that ended in pain- the song’s hero let the heroine down; caused her suffering and loss. One of the most accessible and relatable songs on the album; it is a moment listeners can relate and understand. Beautiful and sensitivity, you are powerless to resist the track and all its magic. Lullaby is one of the most emotional-drained songs on the album. There are images of beauty and a sweetheart’s boots; the purity and possibility of the summer morning. Everything is good outside yet the hero wishes they were dead- something is missing or there is emptiness. Matching summer purity with something raw and unsettled; you get a song that shows a troubled heart and some lingering depression- something that remains in the mind and makes you speculate. It is one of the most naked and honest songs across Big Sky Country. The vocal is pure and focused allowing those words to get inside the mind and make you think- one of the standouts from the album for sure. A Matter of the Hearts again recalls a love-gone-wrong parable. Our heroine has let her man go- and may have been the wiser of the two- but there are recriminations and fall-out. As things have broken down and the love has gone cold; that is not to say the heroine is cold herself- missing her man and unsure why this is. The strength of that love has not evaporated and there are those lingering feeling and desires- represented by a vocal that drips with passion and purity. The composition is one of the most sparse and bare across the record; appropriate given the subject matter. Bonfire is another song that looks at lust and desirability. Our heroine’s heart bursts like a bonfire at the seams; it aches and yearns for a particular man- it is a raw and evocative number. With the intensity of that passion- and the fact her heart and chest are cracked open- there is nowhere else to put that love; the reservoir has run dry. You get a gentility and purity once more; the vocal is at the centre and allowed free reign to intoxicate and seduce. A very touching and honest number, it clearly stems from a personal place- a relationship or situation that has caused some pains and lingering emotions. Jasmine, Rose and Sage could be a Simon and Garfunkel companionship- the second part of the cooking extravaganza- but displays raw emotions and some of the most standout lyrics on the album. Our heroine implores a subject to “hold her hand, still so small and warm in yours”; and she is drifting away like sand. Whereas a lot of the songs across Big Sky Country look at love and simple emotions; here we get something a little more oblique and open- a song that once more provokes you to interpret and understand what is being sung. The vocal and composition are not too heavy-handed and dark; there is lightness and uplift to it that keeps things levelled and buoyant- you never feel depressed or suffocated by things. A wonderfully-written track that showcases Talvik’s song-writing chops; it is one of the album’s most evocative numbers. Give Me a Home has a tumbling guitar coda that promotes grace and beauty. Our heroine pays tribute to the sky- it provides a happier ending and possibility- and wants to be comforting by the stars and their light. Maybe escaping something tormenting and fearful; wanting to run and get away from things- it is an emotional number that shows the soul bared and feelings come to the surface. Where the buffalos roam there is always a chance for something new and safe; maybe things at the moment or not ideal or welcome. Our heroine has been told she will lose faith (as she gets old) but as long as the sky’s there- and the country reaches out to her- she will not lose that hope inside. Fairground has a merry and uplifted sound that contrasts the lyrics somewhat. Our heroine has been down the same road she has been before; there is that fatigue and sense of hopelessness. Maybe life was meant to be better; the fairground lights would shine for her- things are not changing and purpose seems to be lacking. There are obstacles and pitfalls to get around; a constant danger and uncertainty to life- that need to find something happier and more pure. You are always sympathising with the heroine and the strain she shows. A beautiful and sensitive song; it shows that haunted and struggling side to her- something that provokes empathy and self-reflection. So brings things to a close with gentleness and a stunning vocal. The song looks at fears and trepidations; the pains and uncertainties. Whether speaking to a lover or a friend; they (the friend) are regretting things not said and the darkness they feel- things being kept inside and cloistered. Our heroine loves them for it and shows her support; paying tribute to someone that is going through hard times- yet has a supportive friend in Talvik. The album is brought to close with something redemptive and hopeful; the feeling things will get better and the darkness will abate- a necessary uplift and sense of purity. Across the album you get an immense amount of emotion, passion and diversity. The production values are stunning; it allows the vocals and instruments to resonate and shine- bringing the words to life and giving the music the openness it needs. Never polished or too shiny; Big Sky Country is a compelling and stunning work from one of music’s finest artists. The songs tackle a range of subjects, emotions and scenes. One moment we have a song that pays tribute to the U.S. and its varied geography; we go to haunted emotions and dislocated love- heading towards issues surrounding pain and personal unhappiness. Love songs deal with real emotions and longing; themes that listeners can appreciate and understand. Within the 11-track album we get something more oblique and literary. Strange and wonderful characters tangle with meteorological moments and mystical themes- giving the album a depth and range that few other musicians are capable of. Talvik shows herself to be one of the most unique and sharp lyricists around. Deftly able to convey heavy emotions and romantic stress; she is as authoritative when taking her songs somewhere spiritual and oblique. A singer with a rich, passionate and gorgeous voice; here is an artist with few bounds and limitations. There is so much quality and wonder to be found across Big Sky Country. If you are not familiar with Sofia Talvik and her body of work; you will want to check her album out. A window into a wonderful soul with a big future; you cannot refute the amazement and nuance the album offers.